The Elite Edge is a training system designed to produce striking results, consistently. In a health and fitness world filled with confusion and complexity, we provide refreshing clarity and direction. We specialize in working with people who are goal driven and want more out of life. Our clients are amongst the best in the world at what they do and are hungry to do better. Their health and fitness is a top priority. The Elite Edge is built for busy people who want more than the run-of-the-mill, amateur personal training. We are the secret weapon for business owners, thought-leaders, financial professionals, lawyers, doctors and athletes. Thanks to our proprietary methodology we're able to do it better and more consistently than anyone else. In short: we optimize your training and lifestyle to reach your goals in record time. We create only bespoke training plans. No cookie-cutter garbage to be found here. Training is combined with outside-the-gym strategies that trigger consistent progress. Nutrition, sleep, inflammation, stress, movement efficiency and much more are all addressed in great detail. In other words: we teach you the strategies necessary to achieve exceptional results. Our process is a modern take on a very old idea: health and fitness are inseparable. Without one, you can't have the other. To produce the remarkable, you must focus on both. Our system removes all barriers to your success. You get consistent, forward progress in both health and fitness. not just at the cutting edge: we're the one's sharpening it. Personal trainers are hired to deliver a goal. People seek out training because they may not have the expertise to reach such goals. The sad truth is, the vast majority of trainers don't possess the expertise either. Properly executed training is a critical part of reaching lofty health and fitness goals. However, many make the grave mistake of thinking training is the only part. We've seen it over-and-over again. If someone has a good training plan the still fail to see the results they seek. The other half to the story revolves around a deep understanding of biology. Your body adapts to your training. Failure to properly adapt is the limiting factor in drastically increasing performance. Nutrition, sleep, digestion, inflammation, stress, injuries and lifestyle all contribute to how well your body can adapt to your training. Failure to address these leaves giant gaps in potential performance improvements. Hit every nail on the head and expect to see yourself improve by leaps and bounds, no matter your age or previous training history. The Elite Edge evolved as a system of proprietary strategies that produce maximal results in minimal time. 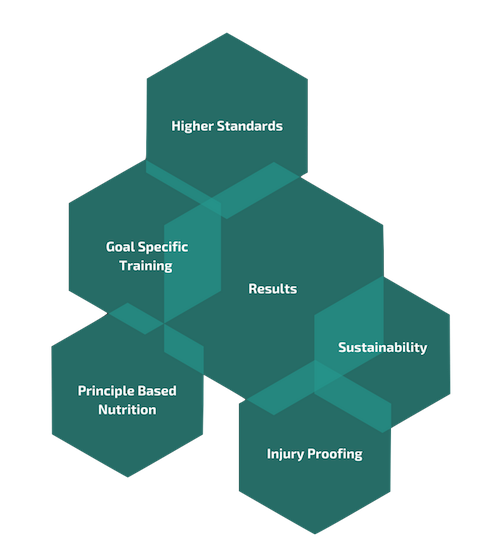 Drawing from top coaches, doctors, and experts, we have our clientele apply these methods to produce world-class performance. It's what allows us to get results expediently and consistently, unlike any other personal training service out there. Do you want to optimize your body and fulfill your performance potential? Do you wish to sustainably take consistent steps forward to your health and fitness goals? Do you wish to have the best on your personal health and fitness team leading you toward the promised land? If so, we may be a good fit for each other. Contact us below to discuss next steps. We genuinely give a sh*t about our clients and their results. Like many of you, we see modern personal training as a broken system. "Personal Training" conjures up images of a genetically gifted 20-something haphazardly taking a client through a random assortment of exercises while posting selfies on Instagram. This is the very antithesis of what we stand for. Regular personal training is high cost, low impact. We get up in the morning because we love what we do, making health and fitness goals come to life. Our obsession over results allows us to offer our clients what no other personal training service can: results faster and more reliably with less time invested. Each Elite Edge trainer has been certified to rigorous international standards. Because they've invested so much in being the best in their education, they take their job seriously and act with professionalism. Regular personal training does a good job of helping you lose weight. Unfortunately, that weight is predominantly lost from your wallet. Unlike other personal training services, our ultimate goal is to get you the results you desire with exacting efficiency. We understand personal training is an investment and we want you to gain a significant return on that investment. We're unique in that we provide our clientele with nutrition plans based on principles. No calorie counting or difficult to follow meal plans here. You'll learn how to manage your nutrition based off a few key rules allowing you to keep these nutrition habits for life. Personal training is much like investing in a custom suit. Style, cut, fabric are all subject to individual preference. The final product is something worth more than the standard off-the-rack suit. As such, we create only fully-individualized, bespoke programs for our clientele. No cookie-cutter plans to be found here. You wouldn't throw a bigger engine in a car who's wheels are out of alignment. In the same way, we ensure that everything is in balance from a movement and strength perspective to ensure consistent and safe progress. We've developed unparalleled systems to address injuries and imbalances to keep the results coming. The vast majority of our clients garner exceptional results training 3-4 hours per week. In other words, they become incredibly fit without compromising their day-to-day life.